Preheat a gas grill over medium-high heat to about 450 degrees. Cut 8 sheets of 12 by 14-inch Reynolds Wrap Heavy Duty Aluminum Foil. Use two sheets of foil per packet. 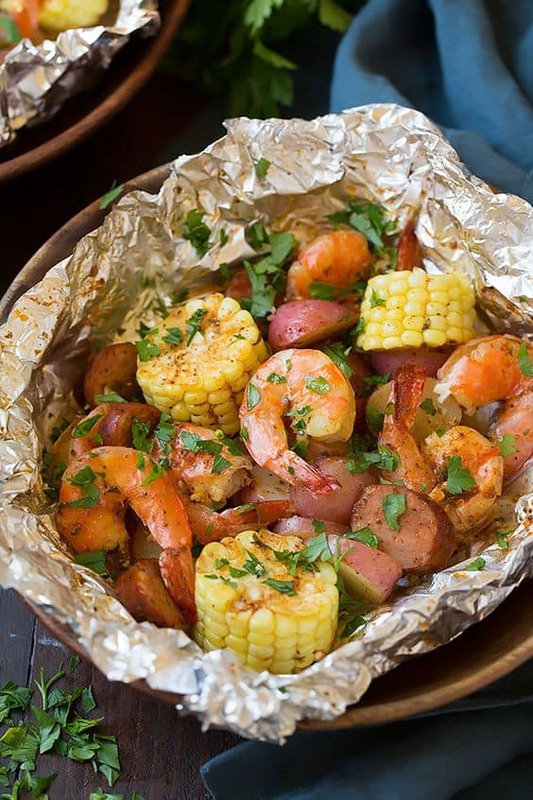 Divide potatoes among each of the four double lined foil sheets (layering ingredients in center), followed by corn, sausage and shrimp. Melt butter in a microwave safe dish in microwave. Stir in lemon juice, thyme and garlic. Divide butter mixture among packets drizzling about 2 Tbsp evenly over each. Sprinkle each with about ½ tsp of the seasoning. Wrap up sides of first sheet of foil, then place second sheet going opposite length and wrap while crimping edges to seal. Grill sealed side up about 15 minutes or until potatoes are tender and shrimp have cooked through. Serve warm garnished with parsley.